We LOVE cover reveals, and Crista McHugh’s just may be one of the sexiest on our fall list. 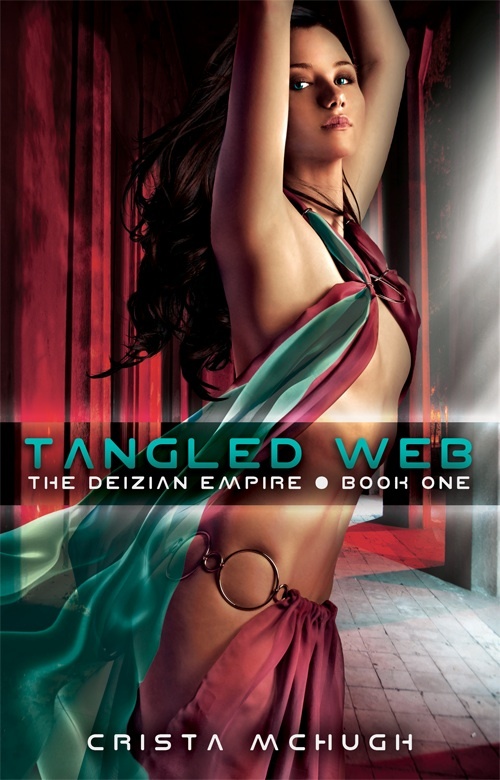 Look for Tangled Web, Book One in The Deizian Empire series. Azurha, a former slave turned deadly assassin, has just been offered the ultimate challenge—seduce, then murder the new Emperor. But Titus is not the tyrant his forefathers were, and his radical ideas might be the glimmer of hope the empire needs. Titus Sergius Flavus has yet to master the powerful magic of his ancestors—magic he must wield if he’s to protect his people—but his father’s death has left him no choice. Rule the Deizian Empire and attempt to right his ancestors’ wrongs, or watch it fall to his greedy kin. More than just Titus’ ideas hold Azurha captive. Night after night, he awakens desires she thought lost, and uncovers the magic of her hidden lineage. As her deadline approaches, Azurha is forced to make an impossible decision—complete her job and kill the man she loves, or fail and forfeit both their lives. This is so up my alley it’s insane! Gorgeous cover and the blurb has me sold. Not available until autumn though? Ouch! That’s going to be a long wait.